Hurricane Conference Amateur Radio Sessions This Morning! Check Them Out -- See Below for Schedule. NHC Session #1 - 8:30 AM to 10:20 AM (all times in CDT). Bob Robichaud, VE1MBR, of the Canadian Hurricane Centre will present on hurricane/meteorological topics and a brief overview of Canadian Hurricane Centre operations. National Hurricane Center station WX4NHC Assistant Amateur Radio Station Coordinator Julio Ripoll, WD4R, will present on WX4NHC operations. Hurricane Watch Net Manager Bobby Graves, KB5HAV, will speak on the Hurricane Watch Net, personal weather stations, backup power and antennas. Louisiana ARRL Assistant Section Manager Matt Anderson, KD5KNZ, will provide a local ARRL and emergency/disaster response communications update. NHC Session #2 -- 10:30 AM to 12:15 PM. Dr. Rick Knabb, Director of the National Hurricane Center, will present on the importance of Amateur Radio surface reporting. Director of Operations, VoIP Hurricane Net and ARRL ARES® Eastern Massachusetts Assistant Section Emergency Coordinator Rob Macedo, KD1CY, will present on the VoIP Hurricane Net and best practices in SKYWARN and tropical systems reporting. National SATERN (Salvation Army Team Emergency Network) Liaison Bill Feist, WB8BZH, will give a presentation on SATERN health and welfare message systems and response during hurricanes. A Q&A session will follow the sessions and door raffle prizes will be offered. 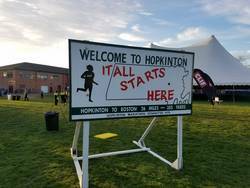 As this issue is being compiled, Monday morning, April 17, the running of the world class Boston Marathon for 2017 is being conducted with major Amateur Radio communications support. From the Ham Radio Boston website: "Prompted by the tragic bombing in 2013 and a subsequent increase in public safety concerns, the Boston Athletic Association (BAA) formed a Communications Committee late in 2014 with a mandate to review and improve the entire communications program at the Boston Marathon. Security and operational challenges had increased, requiring Amateur Radio to function in a highly-structured environment, one following guidelines of the National Incident Management System and the Incident Command System (ICS). public safety partners, resulting in a considerable body of training, planning and operational documentation and a management structure to support and execute the plans during event day." Net Control Operations, Boston Marathon Communications, this week. (photo by Mike Corey, KI1U, who worked for the Amateur Radio communications effort at the Starting Line). the starting line segment at the Athlete's Village. See his photos at right. We hope to have a complete report on Amateur Radio's involvement in this week's running in the next issue. -- Ed. Puerto Rico amateurs participated in the Caribe Wave tsunami exercise on Tuesday, March 21, 2017. CARIBE WAVE is the annual tsunami exercise of the UNESCO Tsunami and Other Coastal Hazards Warning System for the Caribbean and Adjacent Regions. Its major objective is for countries, emergency management stakeholders and communities at risk to test, validate and update their tsunami response plans. A purpose of the exercise is to improve Caribbean Tsunami Warning Program efficacy, serving tsunami warning centers and other focal points. The exercise tests and evaluates the operation of the regional early warning system, to continue the process of communication with the NOAA/NWS Pacific Tsunami Warning Center (PTWC), and to validate the readiness to respond to a tsunami. The Pacific Tsunami Warning Center, located in Honolulu, Hawaii, was formed in 1949 following an unwarned tsunami from the Aleutian Islands that struck Hawaii on the morning of April 1, 1946, killing 159 people. [Click here for background]. From a NOAA/NWS report, "Tsunami occurrences are relatively infrequent in Puerto Rico and the Virgin Islands. The most significant historical events happened in 1867 and 1918. However, the Puerto Rico Trench and other seismic zones in the Caribbean region are all capable of generating tsunamis. Further, vulnerability within PRVI is very high due to the fact of a high population density near the coast and tourist activities concentrated at the coast." In Puerto Rico and the US Virgin Islands, the Caribe Wave exercise is conducted in coordination with the Puerto Rico Seismic Network (Red Sísmica de Puerto Rico), UNESCO, NOAA, and the Puerto Rico Emergency Management Agency (PREMA-AEMEAD). The scenario selected for this year was an earthquake with the epicenter located at the east of the island of Antigua, generating a tsunami incident for the entire Caribbean. Exercise information can be found on the Tsunami Zone website. Historically, Amateur Radio has been an important part of this exercise at an island-wide level with various island radio groups participating on an array of VHF/UHF and HF frequencies. Puerto Rico Section Emergency Coordinator Juan Sepulveda, KP3CR, noted that some Caribbean island nations, such as St. Lucia for example, also conducted their own drills. Other Caribbean islands checked into the Puerto Rico net established on 40 meters. At 10:05 AM on March 21, the exercise commenced with the Emergency Alert System (EAS) being activated on broadcast radio, TV and cable outlets on the island, announcing the drill scenario. Sirens were tested in all of Puerto Rico's coastal cities and towns. Many government and community administrations co-conducted evacuation drills. The role of Amateur Radio licensees was to gather reports from others on how the EAS Alert was heard or learned of, by radio, TV, CATV, NOAA Weather Radio, social media, smartphone apps and/or any other media, and if any heard sirens for alerting along the coasts of the island. A summary of the reports gathered were delivered to PREMA officials during a post-exercise meeting with SEC Sepulveda and ARRL Section Manager Oscar Resto, KP4RF. The primary repeater system used for communication of the requested reports was the Movmiento Radioaficionados de Puerto Rico, comprised of 13 VHF and UHF repeaters island-wide. The exercise net was controlled by the Patriot Amateur Emergency Radio Club, an ARRL Affiliated Club, with the call WP4PQK. The HF net was run by Section Traffic Manager Pedro Irizarry, KP3PI, on 7188 kHz, the regular frequency of the daily Friendly Net, a popular meeting place for Caribbean radio amateurs. Local and neighboring Caribbean stations reported into the net. The other active VHF net was held on 147.090 MHz, controlled by the Radio Operators of the South, Puerto Rico (Radio Operadores del Sur - ROS), which also served as a clearinghouse for reports. Last summer, Jim Andrews, KH6HTV, of Boulder County ARES, Colorado, was contacted by ARRL Pacific Section Manager Joe Speroni, AH0A, who had learned of the nationally recognized digital high-definition amateur TV operations in Boulder, Colorado (Boulder County ARES, BCARES), which has served the area emergency management community so well. 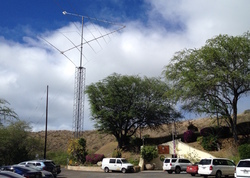 Speroni invited Andrews to visit Hawaii to introduce the system and service concept to the state's radio amateurs and public safety/emergency management administrators. In January, Andrews flew to Honolulu to make the presentation. Andrews prepared and presented to two Power Point presentations, with the first entitled TV in ARES and the second, Amateur High Definition Digital Television. Andrews set up a live operating exhibit featuring a hi-def TV camera, a 70 cm DVB-T (Digital Video Broadcasting - Terrestrial standard) TV transmitter and a DVB-T receiver. the live TV demo running prior to the meeting with a TV camera looking out on the crowd and the hi-def image being displayed on a large, flat screen monitor. The exhibit generated much interest prior to the meeting and during the meal break. Andrews gave both slide show talks with a break between the two for questions. Andrews discussed the BCARES TV service and program and the leading success BCARES members have had in providing TV coverage for public safety agencies, starting in 1990. Andrews discussed the history of amateur TV starting in the 1920s to present day and DTV, emphasizing their use of the European terrestrial broadcast standard DVB-T. Andrews explained the technical details of the equipment he had brought for the display and live demo. The next day, Andrews visited the state Emergency Operations Center (EOC), which is located in an old Army bunker within Diamond Head crater. There, Andrews met with employees of the State of Hawaii Department of Defense, Civil Defense, Emergency Operations Center, and the key radio amateurs in Honolulu ARES and RACES. Andrews again set up his live DTV demo and gave both talks. the rim of Diamond Head crater where it would provide excellent coverage of most of the city of Honolulu. The hams at the EOC requested a list of the necessary items and sources, which was provided. Key items included the DVB-T modulators and receivers from Hi-Des in Taiwan. Andrews also received purchase orders from ARES/RACES members for his own RF linear power amplifiers (both for 70 cm and 23 cm bands), and 23 cm preamps. Andrews' Power Point slide shows are available as .pdf files and can be downloaded from his KH6HTV web site. An extensive set of application notes, all related to amateur TV, both analog and digital, are also available on the web site. The ARRL Alabama Section is initiating a new program of Rapid Response Drills (RRD) meant to test the portable capabilities of operators on a county by county basis.The program is in response to the need for more simulations that âaccurately represent real world conditions in an emergency/disaster response.The key to the drill is to have stations/operators under the Incident Command System operating remotely, portable/mobile. Stations operate "off the grid" and conduct the drill using VHF frequencies without the use of local repeaters; operating simplex is another way to test the capabilities of traffic handling as close to emergency/disaster conditions as possible. Each county EC is encouraged to select at least one location in their county that has the potential to be a "ground zero" for a local emergency/disaster event.The goal is to set up a station there and begin attempting contacts. This effort initially starts with direct contacts and then other contacts by relay, again testing the capabilities of the operators. Once the VHF net has been established and stations have successfully mapped the coverage area for their direct contacts (contacts by relay are in theory unlimited) the drill can then migrate to HF frequencies.The move to HF is also based on real world experience as once the situation has been stabilized, contact outside the affected area is needed. The Rapid Response Drill encourages operators to make their VHF contacts with the Incident Command Net Control station(s) and then using HF to attempt contacts outside their home operational area. The VHF frequency 146.520 MHz -- the National Calling Frequency -- is the initial or primary frequency; for HF operations, the 3.965 and 7.290 MHz frequencies were selected. This is a developing program and the first drill was conducted on Saturday, April 15, 2017. There were some outstanding operations, successes and frustrations, as was expected. In the coming weeks, the Section leadership will be surveying ECs across the state to record lessons learned, gather success stories and capture opportunities for improvement. The instructions for this initial drill were intentionally sparse leaving more of the details to the ECs so the event could be tailored to their local conditions. In Alabama there are coastal communities, urban centers, rural farm land, rivers, lakes, earthquake zones, nuclear power stations, major rail lines and etc., so the operating environments are quite diverse. Another important component was the time frame for the exercise. It was chosen to have the event limited to two hours because as with all emergencies/disasters the first few hours are the most chaotic. Also, limiting the time commitment for a drill allows more focus and participation by local operators. Prior to the drill, operators were introduced to the rapid response program idea during presentations at hamfests across the state and social media sites dedicated to Amateur Radio. One topic from these introductions was Go-Kits and what it means to operate off the grid, what does portable mean, and how "rustic" should the drill be in terms of equipment. The answer to those questions was, of course, "it depends." The RRD presents the challenge: what gear to use and where to set up are the two biggest questions that face communicators in any disaster. For the RRD we encourage each county EC to make those decisions either before the drill started or immediately after. A small, but vitally active Madison County, Florida, ARES group was asked to participate in a mass casualty exercise this month. Madison county is a rural county in the state's Big Bend region. The role of ARES was to establish two-way radio communications between the County Dispatch Center and the Lee School where an alternate care facility would be established in a disaster. The scenario was a tornado that had overturned a bus near the intersection of Hwy 255 and Interstate I-10 s outh of the town of Lee, Florida. At 3 PM, ARES operators began moving to various staging areas awaiting the "Code Red" telephone alert, which was issued at 5:53 PM, received by telephone with the recorded request for radio operators to check-in to the Lee repeater on 145.19 MHz. Madison County EC Pat Lightcap, K4NRD, commenced the initial net, calling for check-ins. Five members who remained at the staging areas checked in. At 5:57 PM, a call was received from county Emergency Manager Alan Whigham, KI4IFH, requesting operators and communications service at the Lee School care facility and the County Dispatch Center. At 6:20 PM, EC Lightcap established UHF communications at the Dispatch Center by employing a handheld and accessing the 442.000 MHz repeater on the North Water Tower in downtown Madison. That system was proved to link Dispatch to the Lee School via a crossband mobile repeater in the school parking lot to Bob Downey, WA1TCC, in the school who was using a handheld radio on VHF. By 6:49 PM, all players left the school; there was no additional need for radio communications. The exercise was concluded and the ARES members were demobilized, standing down. 1. While waiting for the exercise to begin, ARES members evaluated proposed communications paths and links, discovering gaps in coverage. They found that signals transmitted from within the Lee School on VHF were attenuated, rendering communications challenging -- the school was constructed of metal. The group was, however, successfully able to contact radio amateurs in the state capital of Tallahassee, Valdosta (Georgia), Live Oak, Perry, and Lake City (Florida) to confirm access to hospitals in those cities. FM simplex/mobile operation provided reliable links from Dispatch to Lee School with relays only requiring three vehicles. 2. Transmitting signals out of the Dispatch Center on a handheld to the Madison UHF repeater was also challenging. The plan had been to use a crossband mobile repeater to send UHF to the car and then VHF to the Lee repeater, which was near the school. The equipment to do this was not available as had been expected. 3. Exercise players at the school did not seem to know why ARES was there -- no message was generated from the school. Better coordination in the future is needed. 4. 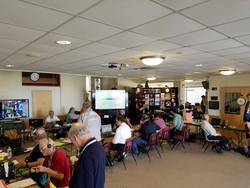 Amateur Radio operators from eight counties were involved, with three counties represented on-site, representing excellent cooperation and coordination. An April 11 article, "Emergency Communications Driving Increase in Amateur Radio Operators," in Emergency Management magazine links the growth in Amateur Radio numbers to interest in emergency communications. "There has been a tremendous amount of interest in emergency preparedness since 9/11 and Katrina, and this is true for the Amateur Radio community as well," ARRL Emergency Preparedness Manager Mike Corey, KI1U, told the publication. "Emergency communications is a gateway into Amateur Radio, and many join our ranks through an interest in being better prepared themselves and as a way to serve their community." The article cites numbers from ARRL VEC Manager Maria Somma, AB1FM, who notes that 2016 was the third year in a row that the total number of new licenses exceeded 30,000. The article also cites ARRL Colorado Section Manager Jack Ciaccia, WM0G, who agreed with the premise that the uptick in new licenses is due to Amateur Radio's emergency capabilities.